[box] To clarify where Over My Shoulder Foundation fits in the world of mentoring non-profits, we’ve taken a look at what we’ve done and where we want to go. Right now, we mainly produce live events which bring together industry leaders in order to pay tribute to great mentors and put the spotlight on the importance of mentoring. Please download the one-page information sheet about Over My Shoulder Foundation to get to know us more and then share it so that we can bring you more stories and events about mentoring, music and design! Over My Shoulder Foundation (OMSF) is a non-profit organization founded by Patti Austin and Dawn Carroll to promote mentoring and Mentorology through music and design. Over My Shoulder Foundation hails Mentorology, the art and science of mentoring, as the number-one priority as they move forward producing live events which bring together industry leaders in order to pay tribute to great mentors and put the spotlight on the importance of mentoring. Think of “Mentoring”, “Music” and “Design” together. Now envision Over My Shoulder Foundation uniting those worlds with the guidance of the non-profit’s two award-winning co-founders. Grammy winner Patti Austin crosses all musical genres, has made 17 solo albums, and has performed her award-nominated hit songs on the GRAMMYS® and the Oscars. As a performer, songwriter and vocalist she has had a star-studded career that began at the age of four, making her one of the most beloved artists the world over and a mainstay on the Billboard Jazz Albums charts. She is Patti Austin, whose extraordinary career continues to cross over boundaries and reach new heights. Because of how important mentoring has been to Patti throughout her life, she co-founded Over My Shoulder Foundation. Patti attributes much of her musical success to her mentors most notably the close guidance of her godparents Quincy Jones and Dinah Washington. Patti Austin is currently being mentored by Boston’s prestigious design community with Dawn’s expertise as her guiding light as she realizes one of her dreams of becoming an interior designer. Dawn Carroll has dedicated a large part of the past 4 years to starting Over My Shoulder Foundation (OMSF) and promoting the idea of Mentorology – the art and science of mentoring. In fact, her passion for Designing the Next Generation has driven Dawn to draw on all her resources to create the dynamic media-driven non-profit organization that exists to further the concept and application of mentoring. Dawn has carved out OMSF’s niche in the mentoring world while managing an award worthy design career at CUMAR Marble & Granite which is currently in its 8th generation of leadership in stone sourcing and fabrication in Everett, MA. Dawn writes, “What do you see that I can be” when considering the similarities of an empty room and an individual who needs a mentor in her article about “Designing the Next Generation“. OMSF Accomplishments keep Mentorology, the art and science of mentoring, as the number-one priority. As OMSF grows as a non-profit organization they will keep producing live events which bring together industry leaders in order to pay tribute to great mentors and put the spotlight on the importance of mentoring. MIDDIES: OMSF partnered with CUMAR Marble & Granite to create and inspire The Boston Globe’s Design New England Magazine MIDDIE (Mentors in Design) awards. The MIDDIES salute design professionals in interior design, architecture,building, landscape design, and related fields, who share their time, expertise, and wisdom with the next generation. 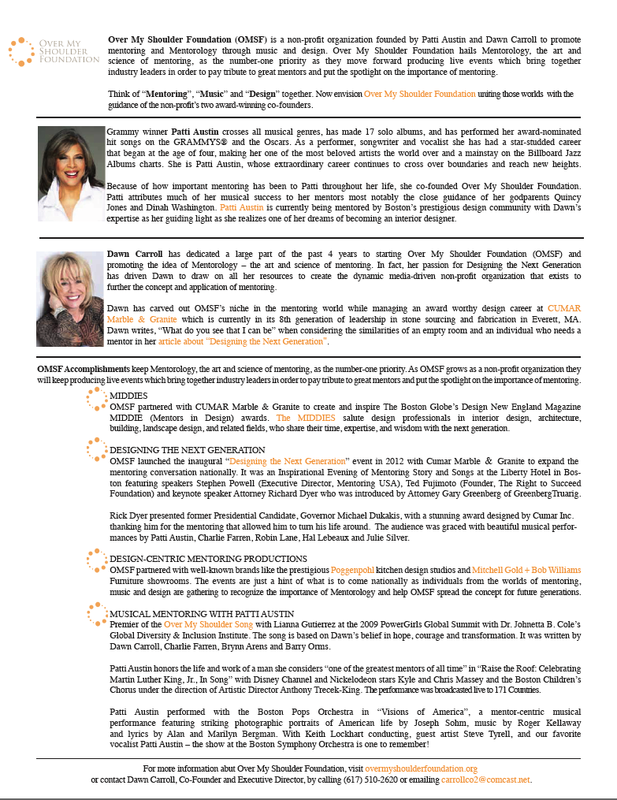 DESIGNING THE NEXT GENERATION: OMSF launched the inaugural “Designing the Next Generation” event in 2012 with Cumar Marble & Granite to expand the mentoring conversation nationally. It was an Inspirational Evening of Mentoring Story and Songs at the Liberty Hotel in Boston featuring speakers Stephen Powell (Executive Director, Mentoring USA), Ted Fujimoto (Founder, The Right to Succeed Foundation) and keynote speaker Attorney Richard Dyer who was introduced by Attorney Gary Greenberg of GreenbergTruarig. Rick Dyer presented former Presidential Candidate, Governor Michael Dukakis, with a stunning award designed by Cumar Inc. thanking him for the mentoring that allowed him to turn his life around. The audience was graced with beautiful musical performances by Patti Austin, Charlie Farren, Robin Lane, Hal Lebeaux and Julie Silver. DESIGN-CENTRIC MENTORING PRODUCTIONS: OMSF partnered with well-known brands like the prestigious Poggenpohl kitchen design studios and Mitchell Gold + Bob Williams Furniture showrooms. The events are just a hint of what is to come nationally as individuals from the worlds of mentoring,music and design are gathering to recognize the importance of Mentorology and help OMSF spread the concept for future generations. Premier of the Over My Shoulder Song with Lianna Gutierrez at the 2009 PowerGirls Global Summit with Dr. Johnetta B. Cole’s Global Diversity & Inclusion Institute. The song is based on Dawn’s belief in hope, courage and transformation. It was written by Dawn Carroll, Charlie Farren, Brynn Arens and Barry Orms. Patti Austin honors the life and work of a man she considers “one of the greatest mentors of all time” in “Raise the Roof: Celebrating Martin Luther King, Jr., In Song” with Disney Channel and Nickelodeon stars Kyle and Chris Massey and the Boston Children’s Chorus under the direction of Artistic Director Anthony Trecek-King. The performance was broadcasted live to 171 Countries. Patti Austin performed with the Boston Pops Orchestra in “Visions of America”, a mentor-centric musical performance featuring striking photographic portraits of American life by Joseph Sohm, music by Roger Kellaway and lyrics by Alan and Marilyn Bergman. With Keith Lockhart conducting, guest artist Steve Tyrell, and our favorite vocalist Patti Austin – the show at the Boston Symphony Orchestra is one to remember! For more information abut Over My Shoulder Foundation, visit overmyshoulderfoundation.org or contact Dawn Carroll, Co-Founder and Executive Director, by calling (617) 510-2620 or emailing carrollco2@comcast.net.